Anyways, my main issue was getting the dimmer switches in pairing mode. The situation was that the green light was solid. This indicates the switch can't connect to the network. The factory reset process is very finicky. Each time I followed the process, where I pressed the paddle 5 times and held it on the 6th time, and then release after 5-8 seconds, was not working. So it wasn't a fluke...see below from CE Smart Home Support who replied to my email just this morning. -Press the top paddle button quickly 5 times in a row. On the sixth press and hold for about 6-8 seconds and release once you see the LED light quickly flicker/flash (this is very subtle). Once released, wait a few seconds, and the LED should begin quickly flashing. If this does not work, please try above steps again until the LED begins quickly flashing (a few seconds after releasing the paddle) signaling the switch is ready for connection. The flicker you are looking for (which signals you to release your hold) is very subtle; do not hold the paddle down longer than 10 seconds. Most of the time the flicker will occur within counting 1 1000, 2 1000, 3 1000, 4 1000, 5 1000, 6 1000. If attempting the process more than once, keep the air-gap switch on in between attempts. It is very important that once you release your 6th press, you do not press anything else and wait a few seconds while watching for the LED to begin flashing. Once the LED on the switch is flashing, within the CE Smart app, click add device and complete the steps to connect your switch." 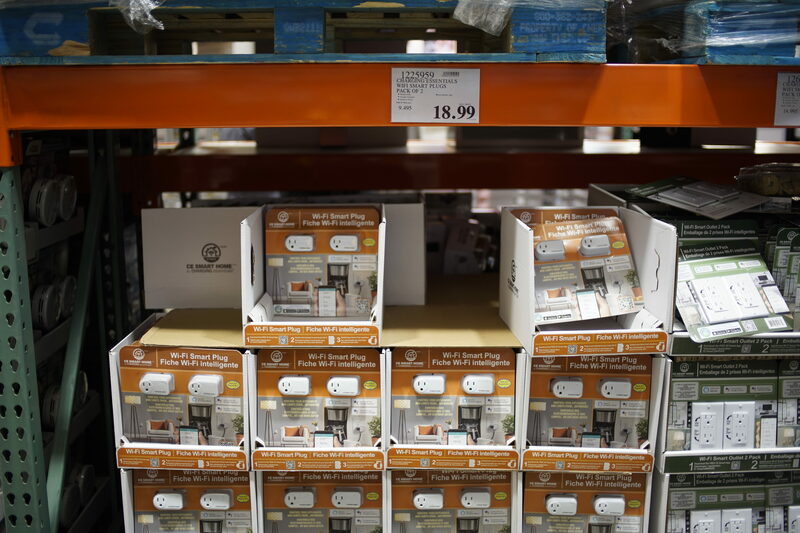 Just wondering if Charging Essentials Wi-Fi Smart Plug x 2 is still available in GTA Costcos these days? So you can use the item number and see if it's in stores. Should be $29.99 in store. With the green energy rebates, it would go down to 21.99 (Ontario) however, that rebate has been eliminated. The green energy and conservation programs were cut by the conservative government. The plug is actually $24.99 in store and the switch is $39.99. I’m actually loving the CE with the Smartlife app. Especially my TP link has been acting up lately for some reason. Both my google home and Alexa did tmr find it, and I had to open my Kasa app to control it. Even the kasa widget didn’t work. I’m using an iPhone. I also have a couple of CE smart plugs and switches and I am also running those using SmartLife app. However - by doing so we will not be able to upgrade firmware when/if CE releases new firmware. Wow $10 diff between online and in-store? interesting! thanks for the correction! I'm using the Tuya Smartlife app and it updated the firmware on my switches recently. All the firmware are the same across the devices. it's all part of Tuya's dominance it allows them to have a huge market share because you can go to them buy a design and tell them how you want it branded they do all the leg work. The only difference is in the vendor ID of the device that gets set, their cloud handles all the federation/segregation. Most of the (Cheap ~$10) plugs and switches on the market uses one of the many reference design provided by Tuya. Some vendors go for the UL/CSA testing (CE did) most do not. I found out between digging around getting Tasmota/OTA Flashing/ Openhab integration. The app itself doesn't really even need much updating. Most the leg work is handled in the cloud by Tuya. "Updating" the app is easy for these vendors as the reference app is also provided by Tuya and gets rebranded. Nice - thanks for the clarification! That was my biggest concern with the CE devices. Do you recommend any forum / site that provides newbie guides for Tasmota/OpenHab/OTA flashing? There's no one source. There's tons of guides on OTA tasmota flashing. Couple guides on MQTT setup in general. I've installed 4 of the smart switches. Had a little problem with the first, but the rest went in with very little problem. Make sure you go to Home Depot first and get a few feet of white 14 gauge cable before you start, so you can connect to the neutral. was at Queensway location today. The plugs are now $ 19 / 2 units. bought another 2 packages. Can we go back and PM? This is an honest question, they show it plugged into a coffee maker but how would that even work? I mean, I get lights because you'd leave your light switches on (although why wouldn't you just use Hue or an equivalent?) But for things like a coffee maker or a kettle it would control the coffee maker or kettle, just let power go it it right? So it can't actually tune them on? hmm, i realized i probably shoulda shot a photo of the switches too when i got home to post and looked at the photo. i don't know. sorry.